Lower Merion towns developed mainly along the transportation corridor of the Pennsylvania Railroad and Lancaster Turnpike. Farmland has become almost entirely residential in the last hundred years. Its hills and valleys dictate the interestingly irregular roads and the unique locations of many of its homes. In accordance with the township's long-term planning, current industry and commerce exist only in a very few original locations: close to Lancaster Avenue, near the individual towns, or in the section of Bala-Cynwyd along City Line Avenue where huge apartment, office, and retail buildings are concentrated, surprisingly near to the little changed residential area of Bala-Cynwyd. Houses still remain large and costly in the outlying section of Lower Merion West, though estates are constantly being subdivided. Many median-income families live closer to transportation in the sub-divisions that emerged in the twentieth century in Penn Wynne, Merion, Bala-Cynwyd, and Wynnewood. Apartments are largely confined to Montgomery and Lancaster avenues and near stations. Sketches of the towns follow, while more detailed information on such topics as their schools and churches are discussed under the specific sections. Ardmore is both a residential and a commercial center located about three miles west of Philadelphia's city line. In 1870 it was known as Athensville, having been named about 1811 by Dr. James Anderson, a classicist and early physician. In 1873 the Pennsylvania Railroad gave notice that it was going to change the name, and Joseph Lesley, the secretary of the railroad, selected "Ardmore," the suggestion of the Reverend George Anderson, pastor of the Lower Merion Baptist Church. The Red Lion Inn, built 1796, located at Lancaster and Greenfield avenues, was a hotel, general store, and center of activity. Closed in 1919, a victim of Prohibition, it was razed in 1941. Lancaster Avenue, formerly known as the Philadelphia and Lancaster Turnpike, was the most important highway of the village. During the 1870s the Lancaster Avenue Improvement Company acquired control of the highway as far as Paoli and thoroughly rebuilt and improved it. Tolls were collected along Lancaster Pike until 1917, when the state took over the roadway. The Merion Title and Trust Company opened for business in 1889 on the corner of Lancaster and Cricket avenues, in a room formerly occupied by Hartley's Shoe Store. The first fire company in the township, Merion Fire Company No. 1 of Ardmore, began in 1889, occupying a lot on the north side of Lancaster Pike, west of Ardmore Avenue. The firehouse also served as the first township police station. The police department consisted of a chief and deputies mounted on horseback or bicycles. When Lower Merion was named a first class township in 1900, Ardmore became the center of government. The first Board of Commissioners met and began construction of sanitary and drainage sewers. Opening in 1900, the Autocar Works was the first large manufacturing industry in Ardmore. The Autocar developed the shaft-driven principle in an American car, and the circulating oil system. The company was the first to build wheels with wooden instead of wire spokes. Workers from Philadelphia reached Ardmore by the Pennsylvania Railroad or by the Philadelphia and Western Railway, which served Ardmore from the 69th Street Terminal from 1907 to 1966. The handsome P & W station in Ardmore, barely a block from the railroad station on the south side of Lancaster Avenue, has been razed for a parking lot. In 1901 building continued at a high rate and many businesses began; several operated by succeeding generations were still running in 1981. Among the well-known landowners in Ardmore were Louis S. Clark, founder of the Autocar Company, who had a home on Old Gulph Road, as did Joseph N. Pew, Jr., an officer of the Sun Oil Company. His brother, J. Howard Pew, at thirty years of age, took over the presidency of the company in 1912 after his father's death. J. Howard Pew, whose home on a high slope overlooked Mill Creek, had already played a major part in the development of petroleum asphalt. Under his leadership during World War I, when the United States was concerned over its loss of tankers, the Sun Shipbuilding Company was organized in Chester, Pennsylvania. Ardmore opened its first movie theater in 1921 to show Rudolph Valentino, Richard Barthelmess, and Lillian Gish. Sun Oil Company built its first gasoline station in Ardmore also in 1921 at Lancaster Avenue and Woodside Road. In 1927 a new idea was put into effect: the development of a variety of shops clustered around a large department store, movie theater, supermarket, and business offices. This was Suburban Square. The stock market crash of 1929 brought great loss to Ardmore residents. At the time Ardmore had three banks--the Merion Title and Trust Company, the Ardmore National Bank, and the Counties Trust Company--all of which closed. The Autocar Company laid off many workers, and unemployment was widespread. Soup kitchens were set up by church groups, and residents who could provide employment for the needy were urged to do so. Eugene Jules Houdry (1892-1962) of Ardmore introduced to Sun Oil the first large-scale commercial catalytic cracking plant. "Blue Sunoco" was the first unleaded high-octane gasoline. During World War II 41 million barrels of 100 octane aviation gasoline were delivered for Allied planes. The Autocar Co. plant closed down and moved to Exton, Pennsylvania, in 1954. A wrecking crew began to demolish the building but on July 31, 1956, a welder's torch touched off the worst conflagration ever seen in Ardmore. The fire threatened to destroy the north side of the Lancaster Avenue business district. All of the township's fire companies fought the fire, assisted by units from Philadelphia. More than a dozen firemen were injured, and it took six million gallons of water to end Ardmore's worst disaster. On the site of the former Autocar Co. plant, construction commenced for a shopping center, Ardmore West. Completed in 1973, it contained a variety of shops, a bank, and a fast-food restaurant. Many of Ardmore's business establishments modernized their properties and increased their parking facilities. Ardmore celebrated its centennial that year with many special activities. Suburban Square, fifty years old in 1979, received a face-lift. Introducing a European concept, it acquired an open mall surrounded by small shops. The movie theater was converted into market stalls, offering a variety of foods The Square's record as the first shopping center in the world accorded by the Guinness Book of World Records proved erroneous after many years. In the 1979 and later issues Guinness has credited a shopping mall near Baltimore with predating it. The largest black community in Lower Merion lives in South Ardmore (extending south into Delaware County). It is a stable community made up of families who found work on the Main Line several generations ago. Of the residents here 65 percent were born in Ardmore. The Ardmore Progressive Civic Association gives voice to their concerns. The 1970 census revealed thirty-six houses below standard in South Ardmore, and a vigorous program has been instituted to help finance improvements and build new housing. In 1974 ground was broken for a condominium of sixteen houses on West Spring Avenue to assist individuals unable to pay the increasing costs of adequate homes. Charitable agencies and government offices concentrate services conveniently in the area. Five organizations serve elderly citizens while the Soul Shack offers constructive activities for children and youth. Beginning with an actual "shack" in the tense times of the late sixties, the Soul Shack keeps its name in the Ardmore Avenue Community center, which was built in 1977 and provides programs for nearly two thousand people of all ages, races, and interests each month. The Ardmore Free Library also adapted to the aspirations of the black community and opened the Gate Library as a book station in a storefront in 1967. It sponsored a tutorial program and maintained a special collection of black literature, history, and biography, which was filed with the regular collection in 1972 when the Gate Library closed. Bala-Cynwyd was settled in 1682 by Edward Jones and seventeen families of Welsh Quakers. John Roberts, a maltster, took up his claim to 150 acres, paid the surveyor in barley, and named his tract "Pencoyd" for ancestral holdings in Caernarvonshire, Wales. His strip of land, which began at the Schuylkill and formed part of the eastern border of the present township, was adjacent to land of Gainor (nee) Roberts, the woman he married in 1684. The history of the area is threaded with the names of people who trace their ancestry to John and Gainor Roberts. Bala-Cynwyd, once called Merionville and its post office Academyville, is bounded by City Line Avenue, Old Lancaster Road, Parsons Avenue, Levering Mill Road, Manayunk Road to Belmont Hills, and the Schuylkill. The 1980 census lists its population at 6,264. The names Bala and Cynwyd were selected by Mrs.George B. Roberts, the wife of a descendant of John Roberts. George Roberts was president of the Pennsylvania Railroad from 1880 to 1897, during which time the railroad built its Schuylkill Valley branch. Mrs. Roberts chose the names for the three stations: Bala, for the ancestral land in Wales, Cynwyd, and Barmouth because of their Welsh origins. Further Welsh influences can be found in the names of such roads as Llandrillo, Llanberris, and Clwyd. Early industry was predominantly farming, milling, ice harvesting, quarrying, and iron manufacturing. Gulley Run supplied the power to operate numerous mills, and the hills on either side of it were quarried for several varieties of stone. Ice was cut from a pond behind a dam across Gulley Run. Two leading ice companies, Knickerbocker and John C. Hancock, harvested ice on the Schuylkill and stored it in huge stone buildings along the waterfront. In 1890 the water was found to be polluted and the companies moved to sites on the Perkiomen. The Glen Willow Ice Company had to be razed when the expressway was built. The Pencoyd Iron Works, founded in 1852 by Percival and Algernon Roberts, descendants of John Roberts, and located along the Schuylkill, became famous for the manufacture of metal bridges. In 1900 it merged with the American Bridge Company, which became a major component in the formation of the United States Steel Corporation. The growth of the City Line area, also known as the Golden Mile, began in the early 1930s. At that time three heirs still living on Pencoyd land--T. William Roberts, Mrs. Algernon Roberts, and G. Brinton Roberts--gave the township a strip of land fifteen wide along their respective properties on City venue to widen the roadway. The extension of the Schuylkill Expressway to City Line opened the area to a tremendous building and development boom. Some of the businesses that built there include WCAU Radio and Television Center (1952), Bala Cynwyd Shopping Center (1955-57), Gulf Oil Co. (1956), Liberty Mutual Insurance Co., Whitman's Chocolates (1957), Barclay Building, now the Germantown Savings Bank (GBS) building (1958), Luria Brothers & Company (1959) and the Marriott Motor Hotel (begun in 1960). Williamson's Restaurant on the twelfth floor of the GSB building affords diners spectacular views of Philadelphia and Lower Merion. Martin Decker's first building was the "191" apartment building, followed by Decker Squares I and II in 1966 and 1969. Although Decker was public spirited and well liked, financial difficulties led to his bankruptcy in 1974, at time his properties were appraised at $84 million. His complex has been renamed "Bala Cynwyd Plazas I and II." The Marriott Motor Hotel, the sole hotel in the township in 1980, opened in 1961. One of the largest hotels in the United States, the Marriott hosts conventions and meetings year round, bringing visitors from the world over to the Bala-Cynwyd area. In a 1979 prospectus for Lower Merion bond sales, the Marriot was listed as the principal employer in the area, with 1,140 employees. Other major employers were the Gulf Oil Co. with 350 employees; Liberty Mutual Insurance Co., 400 employees; General Refractories Co. corporate headquarters, 650 employees; WCAU Radio and Television Studios, 380 employees; and Germantown Savings Bank, 230 employees. WCAU-TV moved from Philadelphia to City Line and Monument Avenues in May 1952. The studio, in its early days, had an entire frontier town built behind its building. Live TV dramas entitled "Action in the Afternoon" were filmed in the open air, with all the accompanying noises of City Line traffic and airplanes overhead. Later six additional radio stations were built in Bala-Cynwyd. The shopping center on City Line Avenue between Belmont Avenue and Conshohocken State Road opened in 1955 and was completed in 1957. About thirty stores share its twenty-three acres. The first occupants were Lord & Taylor and the Penn Fruit Company. Other shopping areas in Bala-Cynwyd are on Bala Avenue, from Union to Montgomery Avenue, as well as several blocks on Montgomery Avenue in the vicinity of Levering Mill Road. A movie theater, the Egyptian, was built on Bala Avenue by Patrick Lawlor in 1926 and is now the Bala. The origin of its early name is evident from the Egyptian characters on the facade. At the start of the 1980s the area had more than twenty-five restaurants, ranging from coffee shops to the Tavern, which opened on Montgomery Avenue in the late 1920s. Bala-Cynwyd has numerous single-family dwellings. Construction continues, with townhouses, high-rise apartments, condominiums, and office buildings as the primary types of new construction. The post office serves a total of 2,982 homes and 29,250 people. In 1979, the Bala-Cynwyd post office moved into a new building at One Union Avenue. Two of the largest cemeteries of the Philadelphia suburbs are in Bala-Cynwyd: West Laurel Hill, originally 197 acres, established in 1869; and Westminster Cemetery, 92 acres, incorporated in 1893. The former is the resting place of Anna Jarvis, founder in 1908 of Mother's Day. A third cemetery, Merion Memorial Park, situated on Bryn Mawr Avenue at Rock Hill Road, was established in 1888 for Negroes and Chinese. James A. Bland, the composer of "Carry Me Back to Old Virginny," "O, Dem Golden Slippers," and hundreds more songs, is buried here. Harry Wright, the father of professional baseball, is represented by a life-size statue. The Lower Merion Library, organized March 15, 1915, began in the old Lower Merion Academy building that had been built in 1812 at Bryn Mawr Avenue and Levering Mill Road. After some years in the Union Fire House it moved to a new building on Levering Mill Road, which was built under the auspices of, and next to, the Bala-Cynwyd Woman's Club. It was dedicated in 1927 as the "Bala-Cynwyd Memorial Library honoring the men who lost their lives in World War I." In 1974 the library moved to a larger, new building, which also housed the Bala Elementary School. The school soon closed because of decreasing enrollment. Meanwhile, the Woman's Club of Bala-Cynwyd regained its building on Levering Mill Road, renamed it "Levering Mill House," and in 1975 converted it for the use of senior citizens. The township finances its operations. The Woman's Club, a civic, social, and cultural organization, holds an annual antique show, begun in 1942. Extensive additions to the club's building were completed in 1955; facilities are made available rent-free to many local groups. Another women's group, the Junior Woman's Club of Bala-Cynwyd, was founded in 1919 and disbanded in 1979. Bala-Cynwyd residents had a baseball team in the Main Line Baseball League in the early twenties. Tennis has been available at the Cynwyd Club since 1913, with squash and bowling introduced later. The Riverside Racquetball Club on Righters Ferry Road opened in 1977, offering tennis and racquetball. Sports facilities at the schools are also open to other groups, and public tennis courts are available at Belmont Avenue Playground and Bala Avenue Playground. Use of the courts dates from 1917, according to the files of the Lower Merion Planning Commission. Belmont Park also has a baseball diamond, paths for walking and jogging, play equipment, and huge rocks in the creek bed which the children call "the whales." Gulley Run Park, at Bryn Mawr Avenue and Manayunk Road, is a small picnic area with the creek running through the middle. A men's bridge club, the Hamilton Club, founded in 1887 in West Philadelphia, moved to Bala-Cynwyd in 1956. The Neighborhood Club of Bala-Cynwyd, organized in 1907, serves the community. A pamphlet, Your Bala-Cynwyd, published about 1937, stated that the group "promoted more frequent trolley service to Bala; improved train service; originated action for mail delivery; investigated purity of water supply, with the result that the state Department of Health ordered changes; underwrote half the cost of ninety-five candlepower lamps for streets; obtained the local telephone exchange; obtained over one hundred new street signs; obtained improved garbage ordinances; obtained many highway and sidewalk improvements; cleaned up vacant lots; opposed increased assessment rates; and secured the building of a new Cynwyd bridge over the railroad." The Neighborhood Club arranges Fourth of July festivities that include a parade, band concert, children's races, and an award to the "Bala-Cynwyd Citizen of the Year." The fire company was begun in 1900 by Algernon Roberts and Emanuel Reyenthaler. It was chartered as the Union Fire Association in 1903, and located at 149 Montgomery Avenue. It has had only six fire chiefs: Luther Parsons, 1903 to 1907; Wayne Babb, 1907 to 1926; Conrad Hettenback, 1927 to 1943; William L. Hornung, 1943 to 1958; Robert Lindsay, 1958; and since 1958, Carl Hornung, son of William. The community that today covers "the Hill" is roughly triangular in shape--the three angles pointing north, east, and west. The northeast side overlooks the Schuylkill River, and the northwest side joins Penn Valley; the southern base of the triangle is the rocky cliff above Gulley Run and Rock Hill Road. For years the cluster of houses on the big river bluff opposite the Manayunk section of Philadelphia had no official name and was linked with the city side of the Schuylkill River by the Green Lane Bridge, rebuilt several times since 1833 and more commonly called the Belmont Avenue Bridge in 1980. The town was referred to as Goat Hill, or the Heights, and finally as West Manayunk, the Indian word manaiung meaning "here is where we drink." In 1953 the new name, Belmont Hills, was chosen after resentment flared over unkind references to "West Manayunk" by author James Michener in an article published in Holiday magazine (April 1950). In 1880 the town was shown on the Pennsylvania Railroad Atlas of the Main Line as West Manayunk. Immigrants from Italy began to arrive, many descended from Christian Albanians who had fled Moslem Turks to settle in southern Italy. They in turn sent for relatives, and by 1914 the Albanians and Italians constituted a considerable portion of the community. The town resembled a Mediterranean hill town with its goats and chickens, garden plots, and women in black, seldom seen on the streets without their men folk. Annually on St. George Day the image of the saint was carried in procession and the pious pinned money to the robe of the statue in supplication or thanksgiving. The Italian language can still be heard in the streets, few residents remember the language of Albania, and St. George Day is no more. The principal street through Belmont Hills is Ashland Avenue, which took its name from Ashland Hill, the twenty-seven-acre estate of Paul Jones, a descendant of the original Welsh Joneses. In the mid-1800s Stewart Lyle, master farmer, bought the house at 100 Lyle Avenue, said to date from the 1780s. In 1900 only fifteen houses stood along the combined length of Ashland Avenue and Mary Waters Ford Road between the Schuylkill River and Conshohocken State Road. In 1901 a real estate company--Wood, Harmon and Company--bought the Lyle estate and divided it into building sites collectively known as "Belmont Heights." An adjacent thirty-acre plot belonging to J. Davis Jones was subdivided between 1908 and 1913 and extends south of Ashland Avenue to the cliffs above Gulley Run. North of Ashland an older development, called Ashland Heights, commands a magnificent view up the Schuylkill Valley. Still another large tract of land on the northwestern skirt of the hill belonged to Jones's relatives until1854, when Sara and Benedict Leedom acquired sixty-five acres. On it was a fifteen-room stone house built in 1787 as a manor house of Glanrason Plantation. The Leedom descendants lost the property in a sheriff's sale in 1927, and Marion Lewis Croyle became the owner. A member of the Croyle family, Guy, who was a contractor, quarry-owner, and nurseryman, occupied the stone house. Lower Merion Township bought the property in 1964 and in 1978 sold it to Joan and Ronnie Doroba. The Belmont Hills Fire Department was founded in 1919 by thirteen men who elected Joseph Grow as its first president. The present building was erected on Washington, near Ashland Avenue, and the original firehouse there was razed. The men of Belmont Hills traditionally found work in the mills along the Schuylkill, on the canal boats that served as river transport, and in factories and quarries bordering Gulley Run. Stone-cutters and masons among the Italian immigrants worked in the quarries and in the two nearby cemeteries, West Laurel Hill and Westminster. An outstanding native son, Henry Jacobs, was the chief stone mason for the Reading Railroad and had built the Flat Rock Tunnel in 1838; he died in 1897. Manufacturing enterprises have existed in the narrow, rock-walled valley along Gulley Run. In 1900 a shoddy mill at the corner of Rock Hill Road and Belmont Avenue made cloth of woolen waste. It was called Belmont Mills sometime before 1913. From 1920 until 1981 the Belmont Cement Burial Case Company occupied the site. Quarrying, at least on the north side of Rock Hill Road, continued intermittently until the 1950s, when complaints from householders on the bluff above stopped the blasting. The biggest and most famous mill to use the pure water of Gulley Run was the Ashland Paper Mill owned by Sebastian A. Rudolph, born in Germany but raised in Manayunk. He produced newsprint for the Philadelphia Record, delivering the paper in huge rolls, 4 1/2 miles to the roll, instead of in flat sheets, an innovation adopted subsequently by most mills. Sebastian Rudolph sued the Pennsylvania Railroad because the locomotives on the Pencoyd Iron Works sidings belched black, soft coal smoke which besmirched the Rudolph paper products. Cornelius Rudolph, his son, served as his lawyer, and the Rudolphs won a large settlement. Cornelius and his family lived on River Road at the river end of Rudolph's Row, a series of attached houses in which the mill workers lived. An open area along the river bank between the row and the bridge was the scene of prize fights, vaudeville performances, carnivals, and gypsy encampments. In 1981 a great-granddaughter of S. A. Rudolph and granddaughter of Cornelius recalled that when gypsies washed clothes on Sunday virtually in the front yard of Rudolph's Row, her mother fumed, regarding such Sabbath labor as akin to mortal sin. The row and that section of River Road were demolished when the expressway was built in the 1950s. In 1981 Belmont Hills had 1,021 residents. A single grocery store on Belmont Avenue caters to neighbors as well as motorists passing to and from the expressway. Service clubs include the civic association, the Senior Citizens' Club, Men's Club, Boys' Club, and the American Legion. McMoran Park, named for a native son and commissioner, provides recreation space next to the library building dedicated in 1969, and both sites overlook the outdoor swimming pools in Lewis J. Smith Park. The Smiths, who owned and operated a road-building firm fronting on Rock Hill Road, gave their residence and adjoining land on Mary Waters Ford Road to the township. The community of Bryn Mawr, nine miles west of Philadelphia, serves residents of at least two counties and three townships. More than half its three square miles lie in Lower Merion, the rest in Delaware County's Radnor and Haverford townships. Its many specialty shops and services draw customers from a distance; its hospital tends patients from a wide area; its private schools attract pupils from both city and suburbs. Known nationally as the home of Bryn Mawr College and locally as an attractive and convenient place to live, the Lower Merion portion, consisting of the old wards of East and West Bryn Mawr, had a population of 5,280 in 1980 compared with 1,800 a century ago. The inclusion of the women residents at Bryn Mawr and Harcum colleges and the two boarding schools distorted official demographic figures in 1970, when Lower Merion's Bryn Mawr contained 80 percent more women than men. The local post office disregards municipal bounds and serves seven hundred businesses and seven thousand dwellings. About 1869 the Pennsylvania Railroad Company established a new community, supplanting a hamlet called Humphreysville, on land that once belonged to the Thomas and Humphreys families. An earlier generation of railroad men had designed a sinuous track to avoid the hills, but new equipment and more powerful locomotives enabled engineers to straighten the route. To overcome local opposition to the proposed location of the new tracks, the directors bought full properties rather than mere rights of way. Between April 1, 1868, and March 18, 1869, William H. Wilson, the railroad company's agent, acquired 283 acres of land with more to be added later. Not only was the railroad built, but under Wilson's guidance the company improved existing streets, opened new roads, planted trees, subdivided properties, and offered land for sale. Although deed restrictions controlled the density, use, placement, and value of potential buildings, these plots found buyers. In his book Reminiscences of a Railroad Engineer, written in 1896, Wilson claimed credit for choosing the new name, Bryn Mawr, for the former Humphreysville. He had discovered the name in the property records of Rowland Ellis, one of the original Welsh settlers, who called his early-eighteenth century house Bryn Mawr, meaning "high hill." Although the new railroad tracks bypassed the White Hall Station on the county line, the White Hall Hotel, dating from early railroad days, continued to attract visitors as did old and new summer boardinghouses. The railroad built its own hotel near Bryn Mawr Station in 1871, the same year the nearest post office dropped the name West Haverford in favor of Bryn Mawr. By 1881 three hundred new dwellings, many of them fine country seats, had joined the original twenty-one houses of old Humphreysville. The local population swelled by some two thousand persons every summer, the season when the Presbyterians took care to collect their annual missionary contributions. Boyd's Blue Book Season of 1884-1885 lists 183 families in Bryn Mawr, 55 of them having "summer residence only" in the hotel. The conductors of the twenty-seven daily trains accepted, in the morning, the empty shopping baskets of the new suburbanites and returned them filled in the evening. In the nineteenth century the Bryn Mawr Citizens' Association provided police protection. The Temperance Hall (c. 1840-1902) on the Old Lancaster Road was the first meeting place for several area churches and groups. The Home News (1876) and the News (1881) kept residents informed. The Bryn Mawr Trust Company (1889) and the Bryn Mawr National Bank (1887), originally located side by side in one building, answered financial needs. The Bryn Mawr Water Company (1892), the Bryn Mawr Hospital (1893), the Bryn Mawr Ice Company, and the Bryn Mawr Fire Company (1903) provided basic services. Some people joined the Merion Cricket Club (1865), the Radnor Hunt (1887), and the Bryn Mawr Polo Club (1898). Many attended the Union Sunday School, the frequent church outings, and the balls and celebrations at local hotels. Members attended meetings of the Lower Merion Society for the Detection and Prosecution of Horse Thieves (actually an insurance company) and the Bryn Mawr District Number Ten of the Sons of Temperance. Some visited the Bryn Mawr Reading Room in a small building near the station. All heard the concerts of the Bryn Mawr Brass Band (1869), which flourished for over a century. Herman Giersch directed the band for sixty years (1912-74). (His son with the same name has led music groups with the Lower Merion School District since 1938.) The pond that had powered the Morris Grist Mill on the Old Gulph Road since before 1851 offered skating and swimming in season. In the 1890s, like other new settlements, Bryn Mawr considered seceding from the township to incorporate as a borough. After Lower Merion took advantage of new legislation to become a first class township the movement subsided. The Bryn Mawr public school was built on Lancaster Avenue after the railroad moved its tracks. In 1916 what is now Ludington Library began in two rooms of the old public school. Private schools included the discontinued Kirk School for Girls (1899-1934) and Miss Wright's School (now the Bryn Mawr College dormitory for graduate students). The Shipley School (1894) and the Baldwin School (1888) continue. Bryn Mawr College, created under Dr. Joseph W. Taylor's will (1880), now owns some eighty acres of the first railroad property. Grocery stores, ice cream parlors, bakeries, millinery shops, shoe stores, and livery stables provided necessities and luxuries. Gane and Snyder (1903), once the source of delicacies transported by liveried coachmen and consumed by affluent households, continued until 1977. The clock-making firm of J. Fish and Son (1888) continues under the direction of the founder's grandson. The Connelly Flower Shop was in business from 1891 to 1980, and the Philip Harrison Department Store has continued since 1891. Yerkes Associates Incorporated (the current name) have been surveyors since 1874. The Philadelphia and Western Railroad, now part of SEPTA's Red Arrow system, opened its Bryn Mawr Station in Delaware County in 1906. Harriton House, which has stood since 1704 on the tract Rowland Ellis called Bryn Mawr, and which became the home of Charles Thomson, secretary of the Continental Congress, became a museum in the 1970s. Wyndham House (1796), owned until 1830 by the Morgan and Elliott descendants of Thomas and Patience Morgan who built it, now belongs to Bryn Mawr College. The Lower Merion Baptist Church, founded in 1808, built in 1809 (and rebuilt in 1875), still stands on ground given by Charles Thomson. In its burying ground lie veterans of the country's wars, and sixteen descendants of William Penn. The White Hall Station, long used as the contagious ward of the Bryn Mawr Hospital, now houses the Bryn Mawr Hospital Thrift Shop. The Church of the Redeemer, opened on Lancaster Avenue in 1851, occupies the building it erected on New Gulph Road in 1879. Railroad Avenue and Glenbrook Road run on the former railroad right of way. The railroad hotel was designed by Furness, Evans and Company and built in 1889 for summer visitors after its predecessor burned. Since 1896 the Baldwin School has occupied it. Bryn Mawr College, the Shipley School, Harcum Junior College (1915), and the Bryn Mawr Conservatory of Music also occupy land William Wilson bought for the railroad. In all, nine-tenths of this acreage holds educational institutions, which preserve and use stately residences designed for the affluent by the leading architects of the last century. Joining are new school and college structures as well as apartment houses and condominiums. Property now adjacent to the railroad holds new shops. The square between the station and Lancaster Avenue is no longer park, but parking lot. The Bryn Mawr Trust Company, merged with the Bryn Mawr National Bank, has presided over a major corner since 1928. Across Lancaster Avenue, on municipal property, stand the Ludington Library, the Bryn Mawr Community Center and War Memorial, the Spring House Senior Center, and the John Winthrop Post #118 of the American Legion, all well used. In 1980 fifty-two daily express and local trains to town offered transportation. The community built by the railroad survives in the age of the automobile. Gladwyne is still a quiet, walkable country village. Its center at the intersection of Youngs Ford and Righters Mill roads, historically known as Merion Square, includes small shops and single or double houses. The double houses, now privately owned, were once tenant housing for the laborers or mill workers of Mill Creek Valley. The name Gladwyne was adopted June 5, 1890, replacing Lower Merion, the official post office name, to avoid confusion with other "Merions." Although Gladwyne is geographically undefined, the postal zoning map boundaries run from Mill Creek Road at the Schuylkill River along the west bank of the river to the borders of West Conshohocken, Villanova, Bryn Mawr, and Haverford. Mill Creek flows through Gladwyne; all but one of its many mills have vanished or are in ruins. The earliest gristmill, begun by 1690, was followed in the eighteenth century by saw, paper, powder, and oil mills and in the nineteenth century by cotton, woolen, lamp wicks, buttons, and gun-parts manufactories. In mid-May 1894 a devastating flood wiped out many of the mills and destroyed all of the bridges. Losses totaled $100,000. A few mills continued on into the twentieth century, but the milling industry along Mill Creek was virtually ended. By 1880, according to William J. Buck, writer of the Lower Merion Township section of Bean's history, Merion Square had 35 houses and 207 inhabitants. Area residents depended for transportation on a stage that operated from Gladwyne to Ardmore, or on the Philadelphia & Reading Railroad, which had a station at the village of Rose Glen. Rose Glen, located a half-mile from the Schuylkill near Mill Creek, was owned in 1836 by cotton manufacturer William Chadwick, and later by his son Robert. In 1884 the Rose Glen post office was located in a store. The small community became known as the Gladwyne Colony in 1912, when psychiatrist Dr. Seymour De Witt Ludlum converted the Chadwick mill buildings into a neuropsychiatric center. After Dr. Ludlum died in 1956, his son S. DeWitt Ludlum, Jr., continued to run the center for several years, but in 1968 all but two of the fourteen old buildings were demolished. Gladwyne has several old cemeteries. The Llewellyn family cemetery on Youngs Ford Road opposite what is now the entrance to Old Stony Lane dates to the eighteenth century, but its headstones are long gone. Two adjoining cemeteries on Righters Mill Road behind the Methodist Church and the Odd Fellows' Hall (Merion Hall Cemetery Association), which began in the mid-1880s, continue to be well maintained. Another cemetery, Har Hazaysim (Mount of Olives), is described under Jewish Synagogues and Cemetery. The village of Merion Square appears to have changed little since 1880. Many old family names are still represented in Gladwyne: Cornman, Barker, Stirk (Winters), Keech, and Roberts. The old Merion Square Hotel on the southeast corner of the crossroads is now the Guard House Inn. The store on the northwest corner, once owned by the Young family, is now the Delaware Market, and the store on the northeast corner, formerly Cornman's and long called the "War Office," is now the Village Store. Nearby, at 366 Righters Mill Road, is a house, once a butcher shop, that was the late-nineteenth-century Democratic stronghold. Members called themselves "Sons of Tammany, " and even had their own marching band. By contrast, substantial changes were occurring at the turn of the century to the rural lands surrounding the village and only ten miles from downtown Philadelphia. Improved transportation brought wealthy city dwellers in search of country seats. The 1908 Atlas of the Main Line of the Pennsylvania Railroad from Overbrook to Paoli (Plates 13, 14, 15) shows numerous estates, including Clement A. Griscom's 90~acre Soapstone Farm and 40 acre Cedar Crest, William Scott's 100-acre tract called Dipple, Charles Halberstadt's Waverly Heights of 103 acres, Seldon Twitchell's 135-acre Pleasant View Farm, and Mrs. Walter B. Saunders's 167-acre Idylwild Farm. The steel-making Wood family owned a total of about 400 acres in the late nineteenth century. Of this, Alan Wood, Jr.'s estate Woodmont comprised 95 acres. William L. Price designed the French Gothic mansion house, which was built in 1892 at a bend in the river on high land overlooking Conshohocken and the Schuylkill. The grounds included two lakes, a fresh-water stream, formal and terraced gardens, aviaries, and greenhouses. By 1953 the house was vacant and the land reduced to seventy-three acres. It was sold for seventy-five thousand dollars to members of Father Divine's Palace Mission Church of the Peace Mission Movement, renamed "Mount of the House of the Lord," and designated world headquarters of the movement. The property on Merion Square Road known as Skylands, built in 1928 for Mr. and Mrs. William Wood, became the Lutheran Deaconess Center in 1953. The Pew Memorial Foundation renovated the house and donated it with twenty-six acres to the Philadelphia Motherhouse of Deaconesses. Additions were made in 1958 and 1968. Thirty-seven deaconesses are in residence, most retired or semi-retired. For fire protection, Gladwyne residents depended upon Ardmore and Bryn Mawr until 1944, when the Gladwyne Fire Company was incorporated. Stuart Bell was its first president. The volunteers met at the Merion Square Repair Shop. In 1950 the company built a firehouse at Black Rock and Conshohocken State roads, and enlarged it in 1972-73. In 1980 the company had four pieces of equipment, including an eighty-five-foot snorkel truck, and a rescue boat. The staff is volunteer with the exception of one full-time paid driver. The Gladwyne Civic Association began in 1945. Griscom Bettle and John Russell were its first presidents. Membership in 1980 included about 760 families. Among its concerns are land use, subdivisions, youth activities, township matters, conservation, and historic preservation. The Gladwyne Library and its league, an important part of the community, is discussed with Lower Merion's other libraries. Gen. Henry H. "Hap" Arnold was born at the Arnold homestead at the southwest corner of Youngs Ford and Conshohocken State roads. The son of Dr. Herbert A. and Mrs. Louisa Harley Arnold, he attended the Merion Square School and the Lower Merion High School. A 1907 West Point graduate, Arnold became a five-star general of the air force during World War II. Another noted resident was John Robert Schrieffer of the University of Pennsylvania, who was living in Gladwyne when at age forty-one he won the 1972 Nobel Prize for Physics with two other American professors for their fifteen-year-old theory of superconductivity. He has since moved to California. The construction in 1953 of the Schuylkill Expressway made access to Gladwyne from Philadelphia more convenient. The ensuing subdivision of large estates by developers and a rising population brought the need for more shops, services, and religious facilities in the village. A school was added to St. John the Baptist Vianney Roman Catholic Church; additions and improvements were made to St. Christopher's Church, the First Presbyterian Church of Lower Merion, and the Gladwyne Methodist Church. A three-unit commercial structure was erected on Righters Mill Road (1955, 1979), and a six-unit French country style shopping center (1959) was built by Walter Durham at the southwest corner of the crossroads. In the late 1970s the type of residential construction in the village shifted from single dwellings to attached townhouses. Another change came in 1981-82 on the former Foerderer tract, where condominiums were clustered together, leaving large portions of the land for open space. This arrangement, the first to be approved in the township, was made possible under the township's 1973 zoning amendment called "Planned Residential Development." The 90-acre Foerderer tract is bordered by Conshohocken State, Spring Mill, Lafayette, and Mount Pleasant Roads. It is part of the former 250-acre estate of leather tycoon Percival Foerderer, who in the twenties built a Spanish style mansion called La Ronda. Gladwyne residents and township officials have long had an interest in protecting the environment and rural setting of the area and encouraging outdoor activities. In 1980 Bridlewild Trails Association, begun in 1927 by Lawrence Saunders and a group of property owners, had a membership of over 150 families who participated in riding or walking the more than thirty miles of marked trails. Under the auspices of this association the Pony Club began in 1959 to foster youth riding activities through the competition of members in Pony Club regional rallies. Club membership began with 40 and in 1980 totaled 321. Hunting has also been popular. In 1885 Mordecai Worrell, owner-manager of the Merion Square Hotel, kept a small pack of hounds for residents and fox hunting guests. The Gladwyne Hunt Club began in 1885, when William Epright moved his large pack from his residence, called The Gulph, to Merion Square Road. Epright's grandson, Malvern, continued the pack until the construction of the expressway put an end to hunting. The Philadelphia Country Club opened its Spring Mill Golf Course in 1927. By 1957, three large tracts of land totaling 294 acres were combined to form the present site. The Mill Creek Conservancy Agreement of 1941 between the township and property owners along Mill Creek prohibited new building one hundred feet either side of Mill Creek Road and the creek. By 1980, 75 percent of the owners had signed. This agreement has made a significant contribution to the protection of the waterway. The Henry Foundation for botanical research specializing in North American plants was established on the estate of the late J. Norman Henry on Stony Lane about 1950. In 1980 Josephine deN. Henry was president and director. The Gladwyne Plan of 1951, for which residents paid eleven thousand dollars, strongly influenced the township's policy pertaining to park land and playground acquisition, and set forth guidelines for zoning and subdivisions. Growing out of this, as well as the township's comprehensive plans of 1937, 1952, 1960, and 1979, have come the following parks, playgrounds, and road sites: Kenealy Nature Park, 87 acres; Gladwyne Playground (W. A. L. Barker Park), 13.10 acres; Henry Lane Park, 18.70 acres; Mill Creek Valley Park, 88.54 acres; West Mill Creek Park, 9.59 acres; Flat Rock Park, 15.29 acres; and the projected Williamson, Merion Square, and Black Rock Road sites. Saunders Woods, 1020 Waverly Road, is a twenty-five-acre tract maintained for the preservation of its natural beauty by the Saunders Foundation. A house and barn are open for public school and scout group use by appointment. The Lower Merion-Narberth Watershed Association, founded in 1974, is dedicated to the improvement and preservation of the township's streams. Arthur S. Wolfe, its first president, began, with his students at Lower Merion High School, removing the trash and debris that had been thrown into the streams. The association stocks the stream with trout and has four sampling stations set up to monitor Mill Creek. It also has an active education program in the public schools. Riverbend Refuge, Inc., at the end of Spring Mill Road, is an environmental-educational center formed in 1974 by the descendants of Howard Wood, Jr., and Phoebe Wood, and staffed by ecologists. Open to visitors are twenty-six acres of nature walks, woodlands, open fields, trails, a waterwheel, early Pennsylvania farmhouse, and barn. In 1976 under the leadership of Betty Brockett, then owner of the John Roberts III House, which was built in 1752, many residents participated in the civic association's efforts to have two of Gladwyne's old areas preserved as historic districts: the MerionSquare Historic District, the village at the intersection of Youngs Ford and Righters Mill Roads and surrounding area; and the Mill Creek Historic District, site of the earliest mills along Mill Creek where Old Gulph and Mill Creek Roads meet. The two districts were designated as historic by the Lower Merion Board of Commissioners and were certified by the Pennsylvania Historical and Museum Commission on June 11, 1980. They were also added to the National Register of Historic Places in 1980. Gloria O. Becker, historic districting coordinator of the project, supervised the architectural survey, on file at the township Planning Department. Haverford originated over the line in Delaware County but it spread northward across Lancaster Pike into Montgomery County. The name itself, which came into use early in the history of Pennsylvania, is Welsh. The boundary line extends directly across the campus of Haverford College to Buck Lane (named after Buck's Tavern, which stood at its intersection with Lancaster Pike). Although largely in Delaware County, Haverford College has been an important part of the community since it's founding in 1833 by the Society of Friends. Families began moving to Haverford from the city during the hot summers. In 1872 Dr. Edmund Cadwallader Evans purchased one hundred acres and built a house at the end of what is now Evans Lane. The following year Alexander J. Cassatt (1839-1906) bought fifty-six of these acres, which stretched from the railroad down Grays Lane and over to the present Cheswold Lane. He engaged the firm of Furness and Evans to design a huge mansion for him and his growing family and named his estate Cheswold. Only the gatehouse still stands. When Alexander Cassatt began his residence in Haverford he was general superintendent of the Pennsylvania Railroad. Many other railroad executives followed his lead and built large homes, increased by the developing railroad and the easy commuting to the city. Alexander Cassatt, running on the Democratic ticket in the heavily Republican suburb, was elected a township supervisor in 1882 and served until 1898. The leadership qualities that brought about his presidency of the Pennsylvania Railroad in 1899 had been freely used in the interest of the township. "Within a few years, the township under his guidance had the finest system of macadamized roads in the nation. Believing the best materials were an economy in the long run, he insisted on granite curbstones and sturdy street signs, saving Lower Merion taxpayers a tidy sum, for those curbstones and street signs are still in use" (Patricia Talbot Davis, The End of the Line: Alexander J. Cassatt and The Pennsylvania Railroad, 1978, p. 99). Of Cassatt's service to Lower Merion, Allen Evans, the noted architect, remarked in his journal: "As a simple token of the appreciation of his friends and the citizens of Lower Merion Township for the great work of neighborhood welfare by Mr. Cassatt, a bronze tablet was erected in 1910 on the Merion Cricket Club wall, at the corner of Grays Lane and Montgomery Avenue, setting forth the work that he had done for the countryside" ("Notes on the Main Line," pp. 35-36). The bas relief, taken from a photograph of Cassatt on his horse as he appeared riding around the township looking after the roads, was the work of a talented young sculptor, Karl Bitter. Allen Evans designed the Haverford Station. The Haverford Civic Association has decided to restore the station, which was damaged by fire in 1978. The civic association is seeking its designation as a historic landmark and has started its project by cleaning the interior walls, which were covered with graffiti. Another leading citizen who settled in Haverford was Clement A. Griscom, a shipbuilder who became president of the International Navigation Company. He shared an ancestor with Betsy Ross, whose maiden name was Griscom. He bought sixty-two acres across Grays Lane from Dr. Evans and Alexander Cassatt, and named his estate Dolobran, the name of a family seat in Wales. The house, located on Laurel Lane and in 1980 owned by John Griffiths, was designed by the architects Furness and Evans and built in 1891. Two notable Haverford citizens lived on Booth Lane in their later years. Catherine Drinker Bowen, distinguished biographer, wrote several books there. Dr. Harold Pender, an outstanding electrical engineer and author of Pender's Handbook for Engineers (1914), lived there until his death at eighty in 1959. In 1903 Dr. Pender proved to French scientists the presence of a magnetic field around a rapidly rotating statically charged disc. Mrs. Moreau D. Brown, winner of the Gimbel Award in 1974, was recognized as the founder of the Antiques Show held annually to benefit the University of Pennsylvania Hospital. Also notable was a mother in Haverford, the late Frances Conrad (Mrs. J. Weir) Sargent, who waited by her television in Haverford in 1965, as did millions of other Americans, to watch her son "Pete" (Charles) Conrad on the Gemini 5 spacecraft. Catherine H. Dixon Sharpe bequeathed her home and a 2 1/2-acre property at Montgomery Avenue and Haverford Station Road to the township for a bird sanctuary. In 1978 her house was razed, and fencing and trails for walking through the wooded area were added. Attractive and interesting shops are grouped around the intersection of Station Road and Lancaster Avenue. The Mellor Book Store, following McCawley's long reign on Station Road, was a Haverford institution from 1937 until 1956, when Clinton Mellor and his wife, Catherine Stroud Mellor, moved to an Arizona ranch. Clothing, antiques, china, glassware, gifts, and a variety of good foods are available at such stores as Natalie Collett, Ann Pakradooni, Jacob Reed's Sons, the John Poteat Collection, the Cheese Wheel, and others. After the Penn Fruit market on Lancaster Avenue closed in the mid- seventies, a mini-mall with quality shops took its place. Two pharmacies, Camp's and Haverford (their present names), date from the 1920s or earlier. A Haverford landmark for sixty years was the Haverford Hotel, built of brick in 1913 at the corner of Grays Lane and Montgomery Avenue. Its stately white columns supported the roof over a wide and gracious porch entrance. Fifty rooms were decorated with Chippendale desks, Chinese screen paintings, mahogany china cabinets, brass sconces, and sparkling chandeliers. Many wedding receptions, including that of President Eisenhower's granddaughter, balls, other parties, and meetings were held there, but in 1973 the hotel was demolished, and Gray's Lane House, an apartment condominium designed by Vincent Kling, now occupies the site. Under construction in 1981 was another luxurious condominium, 101 Cheswold Lane off Montgomery Avenue. Prices of its 35 units ranged from two on the ground floor at $295,000 to the four penthouse apartments already sold at up to $565,000, the highest prices for housing of this type in the entire Philadelphia area, including downtown Philadelphia. Merion is a residential suburban community contiguous to Philadelphia and bordered by Bala-Cynwyd, Narberth, and Wynnewood. Three of the oldest streets in Lower Merion form its boundaries: Old Lancaster Road, City Line Avenue, and Lancaster Avenue. It is intersected by a fourth, Merion Road, which began as a trail between the Darby and Merion meetinghouses. 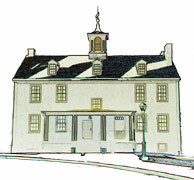 Merion Friends Meetinghouse, at the corner of Montgomery Avenue and Meetinghouse Lane, was built in 1695 and enlarged in 1714 by Welsh settlers who had purchased land from William Penn. A celebration of the stone building's bicentennial was held in 1895, when members and friends sat down in a large tent to hear historical papers, poetry, and a prayer by the young Rufus M. Jones, later to be cofounder of the American Friends Service Committee and a professor at Haverford College. Fifty years later, September 16, 1945, the 250th anniversary celebration took place and Rufus Jones again spoke, as did Justice Owen J. Roberts of the United States Supreme Court and a descendant of the pioneer John Roberts. In 1982 the Merion Friends marked the three-hundredth anniversary of the founding of their meeting. The meetinghouse stands just outside a walled graveyard in which members of the meeting, as well as a number of nonmembers, lie buried. Modern heating has been installed, and indirect electric lighting illuminates the plain white plaster and dark paneling of the interior. Upstairs a small schoolroom contains desks where Indian as well as white children once learned their ABCs. The Merion Friends Nursery School was organized in 1950 by a member, Juliet Mills, in the new Activities Building finished in 1949. The school closed in 1979 because of declining enrollment. Next door to the Friends meetinghouse stands the General Wayne, a typical crossroads tavern of the early eighteenth century, where today luncheons and dinners are served. The inn was named for "Mad Anthony" Wayne, who was entertained here in 1796 after his victory at Fallen Timbers. Beginning in 1806 the Wayne became a polling place, and briefly in 1830 and from 1850 to 1882 served as a post office. Until about 1883 the premises were known to summer visitors as a hotel catering to city folk. The Lower Merion Board of Commissioners had its first meeting at the General Wayne in 1900, and held road repair contract auctions there for several years. During the Depression years the General Wayne ceased to operate as a hotel, was used as a gasoline station, and eventually reopened as a tavern. A fire in 1963 gutted a portion of the main building but left the walls standing and it was rebuilt. In 1980 Barton Johnson owned the restaurant; as founder and president of the Anthony Wayne Historical Association, Inc., he led the effort to place the building on the National Register of Historic Places. Just behind the General Wayne Inn and across Meetinghouse Lane William McDowell sold seventy-one acres in 1876 to the Belmont Driving Park Association for harness racing, then the most popular sport in America. An oval course eighty feet wide and one mile in length was laid out; later a half-mile track was built inside the larger course. The association built a frame grandstand and later added a four-story clubhouse with tower, cupola, and two long verandas overlooking the track. This building still exists in two parts, each made into a private residence. The culminating event in the nearly fifty years of the Belmont's history was the Grand Circuit of 1917, then as prestigious as the Kentucky Derby. In 1924 the park was sold to Martin Maloney, who developed it into 347 building lots in the section called Merion Park. In 1881 the roughly rectangular area of Merion bounded east and west by Old Lancaster Road and Lancaster Pike, and north and south by modern Rockland Road and City Line Avenue, was owned by 31 families: the biggest landowners on both sides of the railroad were Isaac Hazelhurst, James Sullivan, William Simpson, William F. Potts, Joseph B. Townsend, and Thomas Suplee, each owning between 36 and 88 acres, and Jacob Stadelman who controlled 155 acres along City Avenue stretching well beyond the boundary of Merion. In the following three decades, however, executives of the Pennsylvania Railroad as well as other wealthy refugees from the city increased the number of owners in Merion's basic rectangle to 82 in 1900 and 189 in 1913. The railroad was the community's lifeline to the city--even household supplies and groceries were patiently unloaded from the trains and left at the station for cooks and butlers to retrieve. Already a pleasant place, Merion improved after Edward W. Bok, who lived on North Highland Avenue at Merion Road and was editor of the successful Ladies Home Journal, organized the Merion Civic Association in 1913. It chose the motto "To be Nation right and State right, we must first be Community right." So much was accomplished to make Merion the ideal suburb--paving, better lighting, fire and police protection, and ornamental trees--that President Theodore Roosevelt wrote an article in 1917 for Bok's magazine entitled "Model Merion." Bok and his wife, Mary Louise Curtis, founder of the Curtis Institute of Music, were patrons of the Philadelphia Orchestra, whose famous conductor, Leopold Stokowski, lived in Merion from 1917 until about 1920. After World War I the people of Merion resolved to build a "Peace Memorial Community House." As they struggled to collect funds, the founder and president of the Victor Talking Machine Company, Eldridge R. Johnson, and his wife, Elsie Fenimore Johnson, residents of Merion, offered to give their home and eight acres on Hazelhurst Avenue, adding sufficient money to demolish the old house, build and endow "the most beautiful structure of its kind in this locality." Dedication of the Merion War Tribute House, as the community center was finally named, was held May 12, 1924. The Tribute House served as the meeting place for the Merion Civic Association, Merion Community Association (Board of Directors for the Tribute House), Merion Garden Club, Botanical Society of Lower Merion, and American Legion Post 545. More than one hundred party rentals each year help offset the cost of maintaining the building and grounds. In World War II Merion had more than three hundred participants, including several women. Fourteen men died; one was the son of Walter Karcher, co-designer of the War Tribute House. In 1946 rumors circulated that planners in Philadelphia intended to develop one or more major arteries to the west to relieve pressure on Lancaster Pike. One of the suggested routes was Old Merion Road. Alarmed, the Merion Civic Association once again armed itself, as it had against apartment houses, duplexes, unwanted institutions, and the like, to prevent the widening of Merion Road. Under the leadership of the president, Henry Hallowell, Merion united the civic groups along the Main Line to push for an alternate route, namely the "Valley Forge Parkway," today the Schuylkill Expressway. Merion has two museums: the Buten Museum of Wedgwood and the Barnes Foundation museum. Both are discussed in the Arts section of this chapter and in the Art chapter of Volume 2. The Arboretum of the Barnes Foundation, based in part on the collection of trees and plants of Joseph Lapsley Wilson, former owner of the property, offers a three-year program of classes in botany, horticulture, and landscape architecture. The Lower Merion Botanical Society was founded in 1944 to rescue sixteen weedy, rat-infested acres from developers. With the help of the township, the civic association, and Dr. and Mrs. Albert C. Barnes, the Merion Botanical Park was planted between Merion Road and the railroad south of the station. A rural area comprising the three localities of "Fairview," "Crow's Hill," and "Bowler's Woods" came to be known as Penn Valley in 1930, when local residents formed a civic association, still active, and chose the name Penn Valley. This area, less than three square miles, encompasses the land from the Schuylkill River, along Mill Creek Road to Old Gulph Road to Gypsy Lane, along Montgomery Avenue to the Nine-Mile Stone (east side of Montgomery Avenue opposite Price Avenue in Narberth), then by an imaginary line drawn eastwardly until it touches Manayunk Road, and then from Mary Waters Ford Road to the Schuylkill. Penn Valley's first place of worship was the Fairview Union Sunday School, which was built of stone in 1826 by local farmers. It served as a public school from 1834 until 1919. Religious services continued to be held in the building until World War II, when it was closed. The newly formed Penn Valley Women's Club restored the building in 1951, and in 1978 it was designated a historic site by the Pennsylvania Historical and Museum Commission. Although Penn Valley is not a real valley, Hollow Road does follow an old ravine leading to the river. The elevation is from 300 to 380 feet along Hagys Ford Road. It was a farming community until the 1950s when the Charles W. Latch family farm was sold. Their forty-one acres along Hagys Ford Road sloping down to Hollow Road provided vegetables for many local families. Penshurst Farm, the 539-acre estate of Percival Roberts, Jr., was the largest property in Penn Valley, located on both sides of Hagys Ford Road and extending to the Schuylkill. The seventy-five-room mansion, built in 1903, was in the Jacobean style heading into the Stuart with typical English gardens. The rock garden on Conshohocken State Road was a show place with ornamental fountains, a fish pond, balustrades, and terraced stairways. Specimens of every variety of tree that survives in this climate surrounded the main house. A pump carried water from nearby springs to a water tower near the main house from which the water flowed by gravity through the estate's piping system. A private electrical system lighted the mansion. Penshurst Farm had a prize herd of imported Ayrshire cattle, as well as pedigreed Berkshire hogs, chickens, and sheep. The barns and dairy were immaculate, and the natural milk was bottled and sold through local distributors. Penshurst farmers were pioneers in growing fine alfalfa for their cattle. In October 1939 Roberts applied for a permit to demolish the mansion, which was sold to a wrecking crew for $1,000, and the contents of the house were sold at auction. When Percival Roberts, Jr., died in 1943 at the age of eighty-six, the land was sold to the Home Life Insurance Company. It was subdivided for the building of private homes. Other farms included that of George Grow on Hagys Ford Road. Sold in 1921, it is still known as Crow's Hill (the "G" having become a "C"). Another farm was the Grove of Red Partridges on Old Gulph Road near Bryn Mawr Avenue. The property later was part of the tract of 302 acres belonging to James and Michael Magee. John Frederick Bicking, who operated a paper mill along Mill Creek, owned ten acres where Summit Road ends at Fairview Road. The Bicking family cemetery, mentioned in Bicking's will of 1809, still exists at this location. Ardeleage, the estate of Charles Chauncey at Righters Mill and Summit roads, was torn down in 1938, and fourteen homes were built on the property. The Penn Valley area is noted for its beautifully landscaped homes, the Hampton House and Oak Hill apartments overlooking the Schuylkill on the Roberts estate, a Catholic church, and two synagogues. Mail deliveries are made from the Bala-Cynwyd, Gladwyne, Merion Station, Narberth, and Wynnewood post offices. Narberth also serves the community as a shopping area and offers a convenient station for transportation via the Paoli Local. The history of Penn Wynne over the last one hundred years is marked by two major factors: the development of the three-hundred-acre Green Hill Farms plantation, which covered most of the land between Lancaster Avenue and Haverford Road along City Line, and the role of the McWilliams and Maloney Real Estate firm in the development of the area known as Overbrook Hills and Penn Wynne. In 1682 the Welsh Quaker Thomas Lloyd received a grant of 118 acres from William Penn. This land became the nucleus of the Green Hill plantation. The land was bounded by the Philadelphia city line l (roughly Seventy-seventh to Sixty-fourth streets) on the southeast, Lancaster Avenue on the northeast, the Montgomery- Delaware county line on the southwest, and Remington Road on the northwest. By the time Israel Morris and his son Wistar owned the estate in 1869, it had swelled to 300 acres. These acres remained intact until 1910, when the owners began to sell the land gradually, beginning with the property on the city side. The area thus developed slowly from wooded, rolling countryside to the suburb of today. David Price, yeoman of Merion, built a home he called the Old Homestead in 1694 on the estate. The Old Homestead, the birthplace of Wistar Morris (1815-1891), was demolished in 1964 to make way for Green Hill, a $10 million eleven-story apartment complex. Morris was a director of the Pennsylvania Railroad from 1858 to 1891, president of the board of the Pennsylvania Hospital from 1887 to 1891, and president of Haverford College in 1886. When he married Mary Harris of Bellefonte in 1863, he built a stone mansion about three hundred yards west of the Old Homestead. His grandson, Charles Morris Wood, sold this mansion and eighteen acres in 1925 to the Friends' Central School. Sections of Green Hill Farms plantation were sold or leased over the years to various recreational, business, and philanthropic organizations. One hundred acres were leased to the Overbrook Golf Club in 1900, and 5 1/2 acres were given to Charles Morris Wood in 1919 for the construction of the $2 million Green Hill Farms Hotel, which he managed until his death in 1933. His sister, Marguerite Pascal Wood, sold the hotel in 1939 to the fundamentalist branch of the Baptist church for the Eastern Theological Seminary. Although a chapel was added in 1950, it remains relatively unchanged today. Lankenau Hospital acquired the land of the Overbrook Golf Club about 1949 and moved in 1953. A block of land between the golf club and the seminary had been purchased by the Pew Memorial Foundation and later used by the Lankenau School of Nursing. In the early seventies Mabel Pew Myrin bought a piece of land from the Lankenau Hospital on which to build Saunders House, a residential and long-term health care facility for the aged. The Institute of the Ladies of the Sacred Heart purchased land on City Line and Haverford Avenue from Julia Lewis Carter in 1922. They constructed an English Gothic-style building that housed the Convent and Day School of the Sacred Heart until 1971, when, because of declining parochial school enrollments, the property was sold to the Federation of Jewish Agencies of Greater Philadelphia. In 1981 the building housed the Solomon Schechter Day School and the Jewish Y, Kaiserman Branch. Sacred Heart School, now called Sacred Heart Country Day School, moved to Radnor Township. McWilliams and Maloney, builders, were the first to develop and shape the future of Penn Wynne as a residential community, coining the name and laying out most of the streets. By 1927 the firm had built over two hundred detached and semi-detached homes. Community activities centered in the McWilliams & Maloney carpenter shop. The Men's Association, formed out of concern for public safety, community spirit, and favorable zoning, met there in the late twenties. The books of the library, founded in 1929, were first shelved in the builders' office. The Men's Association split to form the Penn Wynne-Overbrook Hills Fire Company, which built its own building in 1931, and the Penn Wynne Civic Association. Development of the land slowed drastically during the Depression. Many new houses stood empty during those years, but by 1936 McWilliams & Maloney were building again. The library, through the zeal of its women volunteers, erected a building in 1947 and added to it in 1962. The need for a school was met by the construction of the Penn Wynne School in 1931 on Haverford Road. A census, taken during the early thirties, showed a predominance of Presbyterians. When the Federation of Churches asked the Presbyterians to sponsor a church, the old carpenter shop of McWilliams & Maloney was renovated and became Christ Community Church of Overbrook Hills in 1931. In 1948 it merged with the West Hope Church to become Christ-West Hope Church, and in 1975 the two congregations, joined by the Wynnewood United Presbyterian Church, became the Penn Wynne United Presbyterian Church. Penn Wynne was home not only to peaceful citizens who wished a suburban setting for their daily lives. The gangster Mickey Duffy, who was slain while sleeping in the Ambassador Hotel in Atlantic City in 1931, owned a mansion on the Penn Wynne side of City Line across from Seventy-seventh Street. Built by McWilliams & Maloney to look like a Mediterranean villa, the structure was white with green satyrs on the sides and black painted palm trees on the facade. Residents recall a man with the pushcart selling Mickey Duffy ice cream, "the ice cream with a kick in it," during Prohibition. The mansion was razed in the late 1960s. The building of Penn Wynne halted during World War II and resumed in 1946. By the late 1940s the farmland had been changed into a residential community of modest homes, churches, and schools. Penn Wynne's growth spurt was over, but its pride in its identity continues. Rosemont is the westernmost of the communities along the Main Line within Lower Merion Township. The line between Delaware and Montgomery counties passes through it near Rosemont Station, placing the main portion in Delaware County. Its post office, originally at the station, was moved to Lancaster Avenue and in 1968 was joined with that of Bryn Mawr. The commercial section, limited to Lancaster Avenue and portions of the adjacent roads, consists of a few individual shops, filling stations, and the printing shop of Charles J. McDevitt, who continues the one-man firm established by his father in the early 1900s. The Rosemont Mall, with twenty shops, was built in 1975 on land where a siding from the railroad used to serve the Mehl and Latta Coal and Lumber yards. Of the two early carriage works, the Derham Body Company continued until 1970. North of the railroad are fine homes on large plots. Rosemont's stately houses on Montgomery Avenue date from 1868 and 1869, when the Pennsylvania Railroad was straightening and leveling its tracks between Haverford and Rosemont. The railroad had to buy almost three hundred acres of farmland, using part for its tracks and dividing the rest into lots. Those on Montgomery Avenue were priced at $8,000 and on the other streets at $5,000. Building was strictly controlled, as it was in Bryn Mawr. Apartment houses have now been permitted on Montgomery Avenue. A seven-story condominium containing sixty-seven units, each of which sold for between $59,000 and $82,500, was completed in 1975. Rosemont's name is derived from Rosemont Farm, the land of Rees Thomas, who reached America in 1683 on the second boat of Welsh people to settle here. He purchased 625 acres lying on Roberts Road extending west between Old Gulph Road and the Delaware County line. In 1785 the southern portion was sold to John Curwen, who, with his four succeeding generations, called their home Walnut Hill. Ashbridge House was built in 1769 on the northern section by one of Rees Thomas's sons, William, and his grandson, Rees Thomas III. Peter Pechin purchased this property in 1850. He left a farm to each of his four children, giving the Rosemont property to Rebecca Emily Pechin Ashbridge. Her husband, Joshua Ashbridge, already owned forty adjoining acres on the south, and the tracts took on their master's name Ashbridge. A small section of the Ashbridge land was deeded to the Pennsylvania Railroad for a station with the understanding that it be named Rosemont. Both Montgomery Avenue and Airdale Road were constructed through the property, which had a long straight lane to Roberts Road. Rebecca and Joshua Ashbridge's three daughters inherited the tract in 1891 and, with foresight, planned wills as early as 1906, when Mary died. With the death of the third sister in 1940 the farm was left to Lower Merion Township to be used for recreation. The sisters ran a dairy on the property, selling milk commercially until the Board of Health instituted milk control in 1922, and the Ashbridges could not meet its stringent standards. An old building east of Ithan Avenue, used earlier as a boarding house for men working on nearby farms, has been replaced by a modern house. The stable-carriage house and the barn are now used for repairing and storing the township's equipment. Now named Ashbridge Memorial Park in memory of the soldiers of World War I, the "Tribute Walk" was built by the Rosemont-Villanova Civic Association to honor those who fought in World War II. The area of rare specimen trees, some ancient and some carefully selected by the late Jack Kenealy, tree warden of Lower Merion Township, has been called the "Kenealy Arboretum." Ashbridge House now contains the library and museum of the Lower Merion Historical Society and is a meeting place for many township groups, while the 28.81 acres provide areas for walking, sledding, jogging, tennis, and a play lot. The civic association participates in a Community Watch program in conjunction with the police department. Rosemont neighbors worked together a century ago when severe property damage and poverty followed the railroad strike. A "Relief Association" and soup kitchen were initiated by a Rosemont resident, John B. Garrett. In 1888 this organization joined the "Protective Association" organized by John Converse, another outstanding Rosemont citizen. The two groups became known as the Bryn Mawr Citizens' Association. This organization hired its own police to protect private property and the families in 1881, almost twenty years before Lower Merion had its own police department. In the 1930s private citizens again united to form the Mount Moro Protective Association to prevent the dumping of trash and hunting on private property. One of the finest estates in Rosemont was Rathalla, a spectacular thirty-two-room medieval chateau designed for Joseph Francis Sinnott, a Philadelphia distiller. Rathalla, completed in 1891, is now the centerpiece of the Rosemont College Campus. Two neighboring mansions are used for the school and convent of the Sisters of the Holy Child Jesus. The three acres of the Austin Memorial Park that lie between Rosemont Station and Lancaster Avenue were contributed to the township by Rebecca J. Austin as a memorial to her father, William Liseter Austin, former president of the Baldwin Locomotive Works. Planted by the Rosemont-Villanova Civic Association with rhododendron, dogwood, forsythia, and hemlock tram, and surrounded by a low wall, Austin Park reflects the pleasant tone of the community. Villanova, at the southwestern corner of Lower Merion Township, takes its name from Villanova University, established as Villanova College in 1843. The university, the small surrounding business community, and the railroad station are in Delaware County. Old Gulph Road, which bisects Villanova and Rosemont, has been used for east-west traffic through Lower Merion since it was an Indian trail. Its milestones, reputed to have been set in place by William Penn, bore a design on their backs similar to his coat of arms. Farmers conveyed their produce or drove their herds through the gulph to the Philadelphia markets along Old Gulph and New Gulph Roads (New Gulph opened in 1728), while its north-south counterpart, Spring Mill Road, dating from 1771, was the route to the ferry across the Schuylkill. The Green Tree Hotel, the most important of the four inns and restaurants that existed along Spring Mill Road, has stood since revolutionary days at the intersection. It was rebuilt after a fire in 1856. Farmers who worked in nearby fields remember quenching their thirst at its bar, or with a bottle of "sody." It was rebuilt again in 1892, and a later owner had the inn turned ninety degrees when it was made a private dwelling. Its blacksmith and wheelwright shops below on Old Gulph Road are now also attractive private homes. Diagonally across Spring Mill and Old Gulph Roads is an eighteen-acre estate owned by the late William Goldman (1888-1974), head of a multimillion-dollar chain of movie companies. Equally well known as a philanthropist, he made many contributions to the promotion of better education for children. He served for fourteen years on the Philadelphia Board of Education and is credited with having made WHYY (Channel 12) an educational TV station. Farther north on Spring Mill Road the Mount Pleasant School was built in 1830 on a small lot bought for fifty-five dollars at the northeast corner of Spring Mill and Mount Pleasant Roads (the latter road opened in 1736). A large one-room stone building that replaced the old school after it had been destroyed by fire was used until 1916. Moro Phillips, a wealthy chemical manufacturer and real estate investor from Poland, and his sons amassed by 1890 the eight hundred acres of Stoke Poges, which included several farms and old farmhouses west of Spring Mill Road. The Stoke Poges house and Pear Grove were among these, as well as Diehl House, now called Appleford, which has a 1728 date-stone although tradition dates the earliest portion from 1705. After a variety of additions the architect, Richard Brognard Okie, redesigned the house and gardens for modern living in 1926. In 1973 Mrs. Louis H. Parsons bequeathed it to Lower Merion Township. With its valuable early furnishings, greenhouses, and beautiful landscaping, it is to be preserved as the "Parsons-Banks Arboretum," and is now available to the community for meetings, receptions, and garden parties. For more than two centuries 594 acres east of Spring Mill Road have made up the Harriton property lying between Old Gulph Road and Morris Avenue. The original 1704 house, once owned by the famous patriot Charles Thomson and sold out of the family, has been restored and is open to the public. The Villanova portion of the property has been occupied and was still owned in 1980 by Thomson's heirs, James and William Maier. After the railroad improved, many executives working in Philadelphia built country seats of imposing dimensions for the summer months. The produce from their farms could be maintained in root cellars for long periods, so that apples, carrots, potatoes, and squash were shipped to the city along with fresh eggs and milk on the Paoli Local, to be met at appointed times at the Philadelphia end. The Northeastern Christian Junior College at 1860 Montgomery Avenue uses a private home as its central building. Clairemont Farm, with 250 acres, belonged to Joseph E. Gillingham. On March 3, 1892, the first cattle tuberculin test in the country was given to the herd belonging to Dr. Gillingham. Morris L. Clothier, head of the Strawbridge and Clothier firm, owned the farm from 1922 to 1947. Now on a 24-acre tract, the Clothier home was purchased by members of the Churches of Christ in 1957 for the purpose of integrating Christian principles with higher education. Calvary Cemetery occupies one hundred acres in the northwest part of the township at Old Gulph and Matson's Ford Roads. It is cut off from the rest of the township by a brief strip of the long-uncompleted Mid-County Expressway, which is intended to connect the Pennsylvania Turnpike at Plymouth Meeting with Chester and Interstate 95. Wynnewood is difficult to define geographically since the post office, the election board, and the Wynnewood Civic Association use different boundaries for it. Wynnewood is surrounded by Merion, Narberth, Penn Valley, Ardmore, and Penn Wynne. It is named for Dr. Thomas Wynne. The first land-owning families bore the names of Jones, Wistar, Owen, and Price, who were primarily farmers. By 1883 new names appeared on the property maps: Henry C. Gibson, distiller; N. Parker Shortridge, Philadelphia banker and director of the Pennsylvania Railroad; and Isaac H. Clothier, department store magnate. These were businessmen expecting to commute to the city. Among the large properties remaining in 1913 were the Wynne Wood tract owned by Edward D. and Robert Toland and St. Mary's twenty-six acres owned by Mrs. S. E. Chichester (Tolands and Chichesters were Jones and Wistar descendants). From about 1890 to 1920 developers such as McIlvain and Company owned many lots and built and sold homes in the $10,000 range to middle-class buyers. This trend in home building persisted, slackening only during the Depression and World War II, when labor and materials were lacking. Between the world wars English Village, begun in 1925, north of the former Ardmore Junior High School, was designed by architect S. Arthur Love, Jr., and built by his brother, Donald Love. The houses are reproductions of Cotswold village cottages with appropriate landscaping. A winding road through the development is called Love's Lane; a circular drive was called King Arthur's Round Table until recent years when residents opted for a less romantic address. After World War II one of the last open areas in Wynnewood was the Shortridge tract, 160 acres of farmland with Indian Creek meandering through, bounded by Lancaster Avenue, Bowman Avenue, and East Wynnewood Road. Local boys were still trapping muskrats along the stream until the forties. Real estate developers had acquired the land in the thirties, but only one garden apartment complex, Wynnewood Park, and a few houses had been constructed. In 1945 there was a building explosion, and 360 single homes were built on the Shortridge Tract in a few years. Two more apartments were built, the Wyndon in 1948, and the Brynwood in 1955. A small shopping district along East Wynnewood Road, across Penn Road from the station, had grown up earlier. This was joined in 1954 by the Wynnewood Shopping Center, built on Shortridge land, housing eleven stores, a supermarket, and the department stores of John Wanamaker and Bonwit Teller. The Wynnewood post office moved from the station into its own building in the shopping center. Office buildings, apartment houses (Wynnewood Plaza and Thomas Wynne) and businesses have grown up in the environs of the shopping center. Wynnewood is a fully developed residential community with a well-defined commercial segment. Shortridge Park, part of the Lower Merion Park System, offers recreation along Indian Creek. Some landmarks, fortunately, have been lovingly preserved. The Owen House, also known as Penn Cottage, at 380 East Montgomery Avenue, has been preserved and is included in the Pennsylvania Inventory of Historic Places. The stone house was built on 442 acres bought from Deputy Governor Thomas Lloyd in 1695 by Robert Owen. Since Owen was a magistrate, his house, described by a grandson as "a large commodious dwelling house," frequently served as a court. The name Penn Cottage derives from the legend that William Penn visited there. Wynne Wood was built in 1818 by Jonathan Jones, grandson of the first Jones owner of Owen House. Jonathan's son, Owen Jones, was born at Wynne Wood and lived his life there. He was a congressman and a colonel in the Union Army. The house was destroyed by fire in 1858, but the contents were saved and the house was rebuilt. The property descended to J. Aubrey Jones, who died childless, and then passed to his cousins, Edward D. and Robert Toland in 1908. By 1900, however, only one hundred acres still surrounded Wynne Wood house. The house was subsequently demolished to make way for homes on Wister, Chichester, Owen, and Fairhill Roads. One part of the original Jones tract, fifty-four acres near today's Wynnewood Station, was bought by Henry C. Gibson, a distiller, for his impressive home Maybrook, designed by George W. and W. D. Hewitt to resemble a medieval Scottish castle, and built in 1881. The grounds were beautifully landscaped; two trees of every variety that would grow in this climate were planted. In the early 1950s, part of the woodland was sold and the Thomas Wynne Apartment House was erected. In 1956 Miss Mary Gibson sold Maybrook to John Merriam. Having reached its centenary, Maybrook is still a beautiful reminder of a way of life that once flourished in Wynnewood. Another portion of the original Jones holding near Church Road was sold to Dr. Malcolm and Hannah Macfarlan in 1894. The Macfarlans purchased Homeworth, a remodeled house of the early nineteenth century, and named by Jonathan Jones's widow, Mary Thomas Jones, in 1840. They changed the name of the house to Ellerslie, Dr. Macfarlan's birthplace in Scotland, and built three additional houses at 201, 207, and 213 Church Road. They had bought Ellerslie for a summer residence, and the property was used as a small farm. Dr. Douglas Macfarlan, one of the founders of the Lower Merion Historical Society, grew up there, and, after 1930, lived there with his wife. His interest in local history and his sketches of historic buildings have conserved knowledge of the area's past. After his death in 1966, the Philadelphia Electric Company purchased the property and resold it. Ellerslie was razed, and luxury homes were built in the late 1970s on the land, some of which the township reserved for recreation. Walter Annenberg has his home on Llanfair Road, which is also on the old Jones tract. According to his biographer, Gaeton Fonzi (Annenberg, 1969), his "communications empire" made him "one of the wealthiest and most powerful men in the United States." Although he sold the Philadelphia Inquirer and Philadelphia's Daily News in the sixties, he controlled a national newspaper, the Morning Telegraph, two magazines--TV Guide and Seventeen--six TV stations and nine radio stations, in addition to several other enterprises. He established the Annenberg Foundation and the Annenberg Fund, which support many causes concerned with welfare, medical education, culture, and relief programs. In 1977 the foundation allotted $967,000. His principal contributions have been the Annenberg School of Communications and the Annenberg Center for the Performing Arts, both at the University of Pennsylvania, and the establishment of the Albert Einstein College of Medicine in Philadelphia. Under President Nixon he served as ambassador to the Court of St. James. Part of the original Price land was sold to Isaac H. Clothier, who in 1881 built Ballytore, a Victorian mansion still standing on West Wynnewood Road. It remained his home until 1933, when it was sold to the Agnes Irwin School for Girls. The school occupied the building until 1961. The house was used in the filming of David and Lisa (released early in 1964) after the school had moved to Ithan. In 1962 the building, with some alterations, became the Armenian Church of St. Sahag and St. Mesrob. Another piece of original Price land made up the farm of Josiah Knox, which appears on early nineteenth-century maps. The farmhouse in 1981 was the west wing of the Knox Home, 718 Sussex Road, a home for the elderly established by Margaret and her brother Charles Knox on the latter's death in 1937. The springhouse of the farm, believed to have been built in 1833 and located at Lakeside Avenue on West Wynnewood Road, has been converted' into a residence by Mr. and Mrs. J. Charles Hutton. Landmarks that have been destroyed include the old Wynnewood Schoolhouse on East Lancaster Avenue. Used as a community center after it had ceased to be used as a school, it became the Nash Realty Company's office before it was torn down in the fifties. Wynnewood's school has undergone changes. The former Wynnewood public elementary school, discontinued in 1978, was purchased and occupied by the Torah Academy. Lawrence R. Klein brought fame to Wynnewood in 1980, when he was awarded the Nobel Prize in economics. A winner of many honors and a professor of economics and finance at the University of Pennsylvania, Klein has been a pioneer in econometric forecasting and has developed the first econometric model of the United States economy. With the "Wharton Model" he uses statistics and economic data gathered from businesses and government to forecast the economy for large corporations and the government. His international project LINK ties together economic forecasts for the entire world. A number of civic organizations work toward keeping Wynnewood an attractive place. Among them are the Wynnewood Civic Association, the Shortridge Civic Association, the Wynnewood Valley Women's Club, the Ard-Wynne Club, and the Main Line Temple Sisterhood.